An Airbus passenger plane was destroyed when it crashed in the Margalla Hills near Islamabad-Benazir Bhutto International Airport (ISB), Pakistan. All six crew members and 146 passengers on board were killed. Flight ABQ202 had departed Karachi International Airport (KHI) on a domestic service to Islamabad. Weather at Islamabad was poor with deteriorating visibility. A PIA flight had landed on the third attempt to land and a flight from China had returned. ABQ202 was cleared for a runway 12 Circling Approach procedure. During the approach the captain descended below Minimum Descent Altitude (MDA) (i.e. 2,300 ft instead of maintaining 2,510 ft), losing visual contact with the airfield. The captain then decided to fly a non-standard self-created PBD (Place Bearing Distance, RNAV waypoint)-based approach, thus transgressing out of the protected airspace by an distance of 4.3 NM into the Margalla Hills area. The captain did not take appropriate action following calls from the first officer. He also did not respond to 21 EGPWS warnings related to approaching rising terrain and pull up. The airplane flew into the side of a mountain. The first officer remained a passive bystander in the cockpit and did not participate as an effective team member failing to supplement and compliment or to correct the errors of his captain assertively due to the captain’s behaviour in the flight. The investigation report said that during initial climb, the captain tested the knowledge of the first officer and used harsh words and a snobbish tone, contrary to the company procedure/norms. The question/answer sessions, lecturing and advices by the captain continued with intervals for about one hour after takeoff. After the intermittent humiliating sessions, the FO generally remained quiet, suffered from underconfidence, became submissive and subsequently did not challenge the captain for any of his errors, breaches and violations. 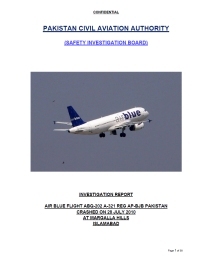 FINALIZATION: "Air blue crash has been finalized as a case of Controlled Flight into Terrain (CFIT), in which aircrew failed to display superior judgment and professional skills in a self created unsafe environment. In their pursuit to land in inclement weather, they committed serious violations of procedures and breaches of flying discipline, which put the aircraft in an unsafe condition over dangerous terrain at low altitude." Distance from Karachi International Airport to Islamabad-Benazir Bhutto International Airport as the crow flies is 1119 km (700 miles).